Restaurant reviews are written shortly after the meal, and with good reason. I generally publish my own within 2-4 weeks, so recounting my dinner at Restaurant Sat Bains with Rooms (RSB) almost six months later is a major departure. Why has it taken so long? Well, life inconsiderately got in the way – Christmas, holidays, time-sensitive reviews – and now it’s April. But I decided to look at this as a challenge, a chance to test my medium-term memory and describe what I ate “more or less faithfully, in three dimensions,” to quote Giles Coren in ‘How to Eat Out’. Regular readers will know I hail from Leicester, although it wasn’t until I moved to London that fine dining captured my attention (despite living in Paris and Montreal; we all make mistakes when we’re young). I quickly developed a taste for it and as my interest snowballed, I came across RSB in Nottingham and was intrigued by this two Michelin-starred East Midlands establishment run by the Raymond Blanc-trained, Roux Scholarship-winning Sat Bains. It remained on the periphery until one day last year when my friend RP, Chef Savla and I put paid to the procrastination and reserved a table. You’re charmed from the moment you cross the threshold. Large pillar candles are dotted around the entrance and dimly lit bar, through which we’re shown to our corner table. The restaurant is split into sections, with several tables in each, then a Chef’s Table overlooking the kitchen. The colour palette is muted grey, white and beige, the ambience classic yet contemporary. 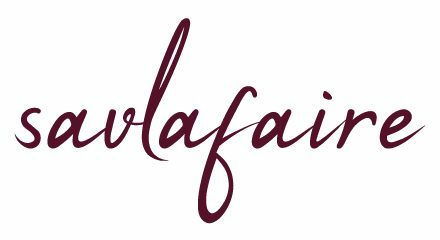 These adjectives are equally applicable to the welcome and service, and once you’ve experienced such suave, it makes you intolerant towards pleasant but ill-informed service; it’s like drinking instant coffee after consuming an artisan Colombian blend. There are no such compromises on the 10-course tasting menu, which begins with bread. The best of the basket is by far a palm-sized, mushroom-shaped one flavoured with stout: crusty, soft, malty and moreish, and I don’t even like Guinness. Horseradish ice cream-filled tubes arouse the palate before the only fish course arrives. A tiny tower of scallop discs, partially sheathed in an apple jelly jacket, decorated with cubes of pig’s head and katsuobushi (dried, fermented and smoked tuna) and a dollop of ponzu. This is mellow, mild and exotic, with a hint of sweetness on the finish, which incidentally was too subtle in RP’s view. Chicken is the first poultry offering, served as frozen pâté. It may sound as appealing as plunging into a pool of ice-cold water, but it works superbly well: the richness of the popcorn-style chunks slowly unfurls as they warm up in your mouth. Partridge is semi-successful: the deep-fried leg remains tender and is flavourful on its own while the breast is bland until combined with the distinctive notes of bacon and beetroot. The meat trio finale is deer tartare, with cèpes, juniper and chocolate. Like the chicken, the ingredients look like they’ve been gathered in one hand then nonchalantly thrown onto the plate. On our pre-dessert kitchen tour, we watch the chef plate up, carefully lowering each element using tweezers; nothing is haphazard. It’s a delightful dish mixing soft and crispy textures with a smooth and earthy flavour profile. 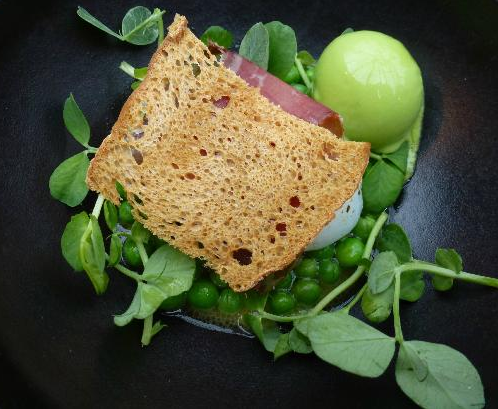 We go off piste when we’re told about Chef Bains’ signature dish: slow-cooked duck eggs, pea sorbet, fresh peas and air-dried ham. The presentation is elegant, the smells inviting, the tastes sharp and the textures velvety. Unsurprising, then, that this dish won the Great British Menu series in 2007. Of the two vegetarian dishes, kohlrabi is transformed into “tagliatelle”, shaped into a tidy conical pile then drizzled with pesto, prepared in a mortar and pestle tableside: al dente, fresh and novel. But the real surprise is the wood-fired potato with cobnut, Parmesan and truffle. The true beauty of this lies in its simplicity, and one mouthful triggers fond flashbacks of eating fluffy jacket potatoes at the kitchen table at home, regaling your parents with your latest adventures. This is comfort food which has been reimagined and refined without losing the essence of what makes it so special. Why have one dessert when you can have four? Sweetcorn ice cream – refreshing once the brain adjusts to the flavour in a sweet dish – is followed by a smoke-and-cherry infused aerated block of chocolate, i.e. Aero for adults and Jammy Dodgers with an intense tomato filling instead of jam. Creating memorable food goes beyond showcasing clever techniques and beautiful plating. Yes, these are important factors, but the dishes should also be powerful enough to elicit a positive emotional response. The ability to do so proves that the chef has connected with their creations and can in turn personally connect with their diners. At RSB, Sat Bains achieves this with aplomb. This looks good, but I never think to order a sandwich at a restaurant? I’m not sure why though because it looks yummy.